This is a great way for HTC to manage the process and allow for those of us who would want to take advantage of the unlocked bootloader world while still ensuring that the everyday user isn’t going to damage their device. Good news for everyone. No word on the actual date HTC will start this process but as they’ve stated we expect it to happen sometime this month. okay i know imma sounds like a COMPLETE phone noob but what does “Unlocking the Bootloader” do for your phone as far as customization wise??? and adding apps? so in other words rooting and installing custom roms and stuff??? It unlocks the phone so you can load custom operating systems, and can control the root system of the phone. so basically installing roms without voiding your warranty??? it’s not just for custom roms, some apps need rooted phone to be able to install too. Allows custom roms… and more flexibility over what you are able to do on your phone. Not that it matters anymore, anyone who is willing to go through the trouble to unlock it through them, is already unlocking it with the ‘Revolutionary’ tool from AlphaRev and unrevoked. The only thing I can think of is if they guarantee warranty through that unlocking method. This is a fair solution – the modders get what they want but don’t get to abuse the HTC 1yr warranty. HTC makes their customers happy. Seems like a win-win. Oh just wait until the backlash over voiding your warranty. Any word on when T-Mobile will push that OTA that fixes all the bugs? The OTA that was already pushed on the unbranded devices and on European devices I believe. Soon, very soon (estimated) in the coming couple of weeks. Don’t ask me how I know because I’m not telling you. So HTC want us to lose our warranty even for just disabling bloatware? Better to use the unlock tools available on XDA. does it still void your warranty??? Yes, if you root your device and install a custom ROM, your warranty is void. There’s a lot of benefits associated with running custom ROM’s such as lack of bloatware, overclocking, enhanced customization and regular software updates, but you should do your homework and know what you’re getting into before you do it. Rooting and installing ROM’s is not for the faint of heart. If you’re really interested, check out XDA Developers and CyanogenMod. (Just do a Google search for those terms) Join the site, talk to some people, post in the forums, and do your research. Once you feel like you’ve got a good handle on things, then, and only then, make the leap. Rooting and ROMing are not dangerous if you know what you’re doing and you follow directions EXACTLY. Lol, sweet. Then you should have no problem at all. Rootzwiki is another good site for info on the subject. Can I come over to your house and steal something you have created? Why is it that most T-Mobile employees on this forum have a holier then-thou attitude? Are you just that bitter that you have to insult the people who pay their bills every month so that you can keep collecting a paycheck? I don’t work for tmobile. Well, that’s a shame, because if you did work for T-Mobile, at least you’d have an excuse for acting like a corporate shill. That’s the best you can do? Alex Jones? By the way, it’s David Icke who believes in reptilian shapeshifters. If you’re going to use conspiracy theory as your foundation for ridicule, it would be helpful to be educated about which conspiracy theorists espouse the particular belief you’re mocking. Otherwise you just sound ignorant. He is essentially telling us he stole Wii ROMs. How is it ‘holier THAN thou’ when you’re calling out a blatant crime. Lemme come over and take your stuff and see if you call me out. In my opinion media piracy is a victimless crime. I understand the argument on the other side about the impact on publishers, software designers and so on, but it just doesn’t strike me as terribly compelling. Generally speaking, I have no interest in policing the behavior of others, and the means by which someone obtains video games, movies, music and such things simply doesn’t interest me that much. I don’t think its a productive use of time to condemn someone on a forum who is simply asking for some help or advice about a subject they are trying to learn about. Nice. I’m well aware that S-OFF has been out for some time on XDA, but since I’m a noob to the whole process I’d rather go with an easy manufacturer-provided solution. Sounds like the method HTC is creating for us is very easy. I’m not too worried about warranty either because I only plan on eliminating bloatware in order to speed up Sense a bit (which I like but is a bit too slow for me). The screenshots I have seen of custom roms just can’t match the OEM look, although the video I saw of CM7 showed a VERY snappy Sensation. Have you checked out Virtuous Unity? It’s based on Sense 3.0, I hear good things about it. I haven’t tried it out because I’ve got a G2, and installing it would require me to flash the Desire Z hboot and I haven’t really found a good guide for switching back to the HTC Vision (G2) hboot, and I wouldn’t want to keep the Desire Z hboot (and in so doing lose a couple hundred MB’s of available memory for apps) if I wasn’t sure that I wanted to stick with Unity. If and when I get another phone though, I intend to try it out. I like CM7, but Sense is really pretty looking. Never heard of it. I know a lot of people have been working on what are essentially Sense 3.0 ROMs that are improved and faster, so I’ll probably look at a few. But if simply removing bloatware reduces the lag that the Sensation has, I’m sticking with the stock ROM. Using it right now, its not just about the bloatwares being removed, there are also some tweaks made. Very fast rom, xda is surrounded with really good devs. I cant ask for more. So is this Virtuous Unity visually identical to stock rom? It just has performance tweaks and enhancements? Well, check out the developers webpage. But anyway, to answer your question, I think it is virtually identical to the stock ROM on the Sensation as they are both Sense 3.0 ROMs. Late. Most of advanced users have already unlocked and testing different roms. Extremist rooters? What exactly is extreme about wanting to customize your phone to one’s own taste? And are you suggesting that phone prices have increased because the manufacturers decided to listen to their customers and provide a feature that there demand for? You think because now they’ll be able to sell more phones that the prices are going to go up? I’m guessing economics isn’t your strong suit, huh? Yes companies should respond to people who disrupt their business by spamming their facebook wall. Well, I don’t use facebook, and I have no idea what a facebook wall is, but I do know that companies that would like to stay in business generally consider accommodating their customers to be a wise course of action. Particularly when those customers are technically savvy, and thus probably have a great deal of influence over the purchasing decisions of their friends and family, as far as electronics are concerned. Truthfully, I think HTC looked at it less as a “responding to a nominal number of customers’ desires” and more as “great press for unlocking something on our cool devices”. The majority of people (like the first post) are not going to know WTH unlocking the bootloader does but damn it sounds like HTC is doing the right thing. Agreed. Most people have no idea what the bootloader is and could care less if its locked or unlocked. But either ways, it’s good for the customers, it’s good for Android development, and I think that’s what we should all take away from this. Aaah BOO HOO HOO now that these douchbags got their way now they crying because this unlocking still voids their warranty. I don’t see anybody crying about it. I see people asking reasonable questions so that they can make an informed decision. But of course, you probably just think all the customers are retards, don’t you? Do you think you might just be jealous because rooting a phone is beyond your limited technical skills? Typical you think that rooting is such a difficult process. It was a snap rooting my G 1 and mytouch 4g. Either ways though, it would appear that instead of being a retard, you’re just a hypocrite. Congratulations. I applaud HTC for stepping up and delivering this to their customers over what I imagine were pretty strenuous carrier objections. I’ve had nothing but HTC phones since the G1 came out, and I’ve always been very pleased with them. This decision means I’ll continue to patronize them in the future, and I’ll recommend their products to people who ask me for advice about phones. It’s nice to see the customers win for a change. Too late, we hacked the boot loader a week ago, so all of us that needed it, have already done it. Lovin’ my unlocked and rooted HTC Sensation 4G. How did you get to unlock it? Look up sensation android development it should be the 1st post on the very top..
You mean… HTC Sensation 4G Up First For Losing It’s Warranty. It’s not forced. It’s up to you to do it. So what’s the big deal? Will this update fix a the problems that the HTC sensation presented or will it only give people the option to unlock for bootloaders? 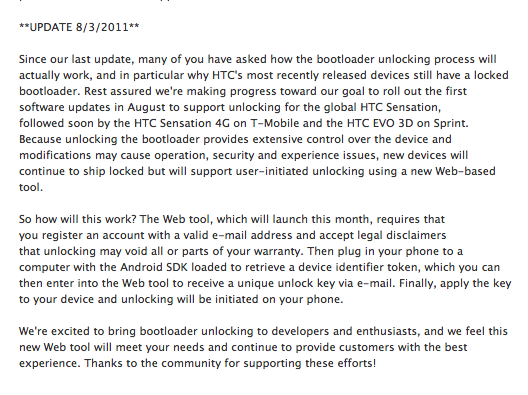 It sounds like this is just a process to unlock the bootloader. Are they ever going to release a software update that fixes like the battery life, sudden shutdowns, loss of connection, etc? 1) Is there anyway I can unlock with out signing my warranty away (a way around it)? 2) When and if I unlock it, which would be the best custom ROM to run? e.g. overclocked processor at like 1.7 Ghz etc. 3) Lastly, is there anyway to unroot if I ever had to use warranty or anything of that sort?